Have you heard of Flash Gallery? There are three Signature Artists in this pop-up gallery of nine local artists. 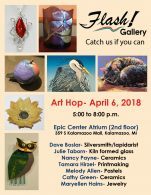 The next pop up in the Epic Center’s atrium for the April Art Hop. Melody Allen will have new pastel paintings on display, and her exceptional notecards – including a new cat collection. Maryellen Hain will show her whimsical fused glass creations – a bright bit of color for any corner of your life. And Nancy Payne will have her ceramic birds and lighthearted planters along with other beautiful ceramic works.